What Does the Energy of Spring Hold for You this Year? In the spring, spiritually, we change our facing from the North and look to the direction of the East. The energy begins to shift. We see this all around us through the flowers, the trees and the veggies too. The elements of air, fire, earth and water shift too. We feel this in our body, mind and Spirit. The direction of the East brings in a fresh, young and optimistic energy. Our Spirit sees, hears, feels and knows all this new hope that is available as we move through the Equinox period. It’s a time to rebalance our energy. A time to let go of the winter energies that tend to keep you stuck and depressed in old patterns. Everyone is experiencing a collective shift in consciousness, and the shift in seasons can help to heal some of this uncertainty. I know for myself, quite often at this time of year I can get caught in the comfort zone of my life. I don’t want to get out. I don’t want to look at what is underneath the surface that is dragging me down. When I lived in New York, I loved hiding in my sweaters and hanging by the fireplace. But then the spring would arrive. I would make myself go outside (sometimes still snow on the ground) and place my hands on the Earth and feel the vibration of life, Reiki, coming right back at me. That energy, Universal Life, inspired me to cross the edge from one season to the other. Seasons change and every year is different. Right now, we are in a time of, as Mystic Mamma says, “Collective Evolution.” We are moving through challenging situations and a disruption of the norm. So how do we embrace these challenges yet face the newness of a season that brings in hope and opportunities? By slowing down and pulling your energy within. I know that can be challenging for many, including myself, but I also know this is the time to allow rather than push. 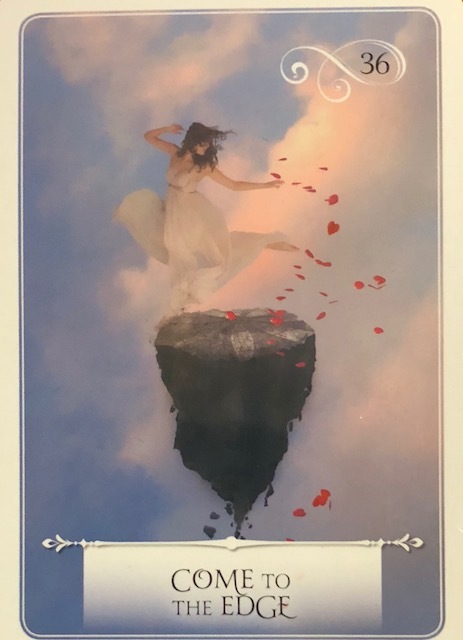 The card that comes forward from the Wisdom of the Oracles is Come to the Edge. It’s about standing on the edge of your passions and desires. It’s about taking that chance right now as we move into the new season and not letting fear get the best of you. The energy of this card reminds us to open up to the creative force within that can propel you forward. Allow the edge to come forward for you. You don’t have to rush it, but don’t avoid it either. This can be challenging and it does take courage. One of the ways I find that helps me to do this is to look to the stars, the moon and the planets to understand how we can align our Spirit to help with this shift of energy. In today’s episode of The Empowered Spirit Show, we welcome back Laurie Zelinski from ZGirlAstrology.com to offer her Empowered Astrology Report and to help us understand the Cosmic energies around us. Laurie Zelinski has had a long time fascination with stars, planets and Astrology. She believes that Astrology is a tool that can help you understand and heal yourself and ultimately leads to radical self-acceptance and love. Her studies led her to uncovering the importance of the North Node in the Natal chart and what it can tell you about your soul purpose. She is passionate about helping others discover who they are and live their soul purpose. Astrology is so much more than just reading a horoscope in your favorite magazine! In this episode we talk about planets in retrograde (Jupiter and Mercury) and the influence of Mars and Venus. We discuss the shifting of sun signs from Pisces to Cardinal sign of Aries. As Laurie will tell us, it’s time to change it up. Do something different. Get a haircut! Spruce up your appearance. But the biggest message she offers us for right now is that we have an extra amount of healing vibration coming in these next several weeks to do some restoring within. To take the time to slow down instead of rushing into spring to heal deep within. If you do take this time, eventually you will emerge fresher, stronger in your Spirit and with more courage to shift your life forward. With all these challenges around and the healing energy of the cosmos, come join us over in The Empowered Spirit Circle on Facebook for a Spiritual Challenge. Let’s use this time to join forces and raise our vibration together as we work with this healing light. There is so much healing coming forth. Allow the deeper aspects of your Spirit to emerge. Now is not the time to give up or give in. Empower your Spirit as we move into spring! Stand on the edge. Be willing to go within and slow down so that profound soul healing can occur! Laurie can be reached at lauriezastrology@gmail.com. Her website is www.zgirlastroloy.com. She can also be found on Facebook and Instagram. Join Reiki Masters from the Spiritual Development Leadership Group and Terri in a Spring Equinox Celebration at Birmingham Yoga. Don’t forget to join in the Empowered Spirit Circle for the Spiritual Challenge.